Parramatta is in the geographical centre of Sydney, to the west not far from Fairfield, Castle Hill or Homebush. Hazel Ryan Oval, Whitbread Place North Rocks, NSW 2151 Magenta marker on the map below). The car park is accessed via Whitbread Place which runs off North Rocks Rd. There are Toilets available at the grounds. Click Here for a more detailed map and directions to Hazel Ryan Oval. Kingsdene Oval, Felton Rd, Carlingford NSW 2118 (Pink marker "A" on the map below). Kingsdene Oval is situated at the intersection of Felton Rd and The Arcadian Circuit. 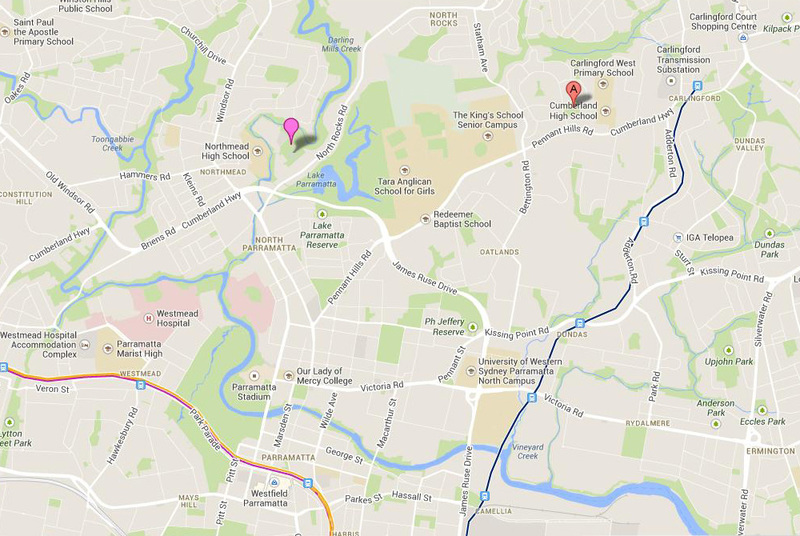 Best access is via Westminster Avenue off Pennant Hills Rd or Felton Rd off Bettington Rd. There are Toilets available at the grounds. Click Here for a more detailed map and directions to Kingsdene Oval. There is On Street parking only.